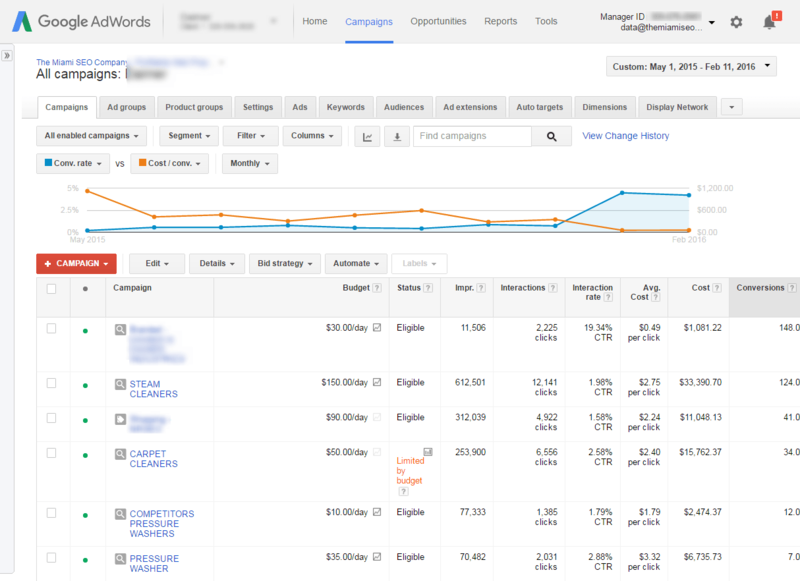 The image to the left (or above if you’re on a mobile phone) shows a campaign in Adwords that has $16,000+ worth of click data where the average conversion rate was 26% and the cost for each lead (aka call, form submission or chat request for services) was only $20.79. This client is using a very agressive strategy to ensure that their business gets as many leads as possible on keywords that are historically proven to produce leads at a cost that is around $20-$25. With call tracking configured at the keyword level, we aren’t spending any money on keywords that over time have not produced any calls which makes this campaign work great for our client. If you click on the screen shot to the left, you’ll notice 2 things about the linear graph. A blue line representing the total number of daily conversions and an orange line representing the daily cost for each conversion by calculating the total spend divided by the number of conversions. A conversion is a phone call or a form submission. 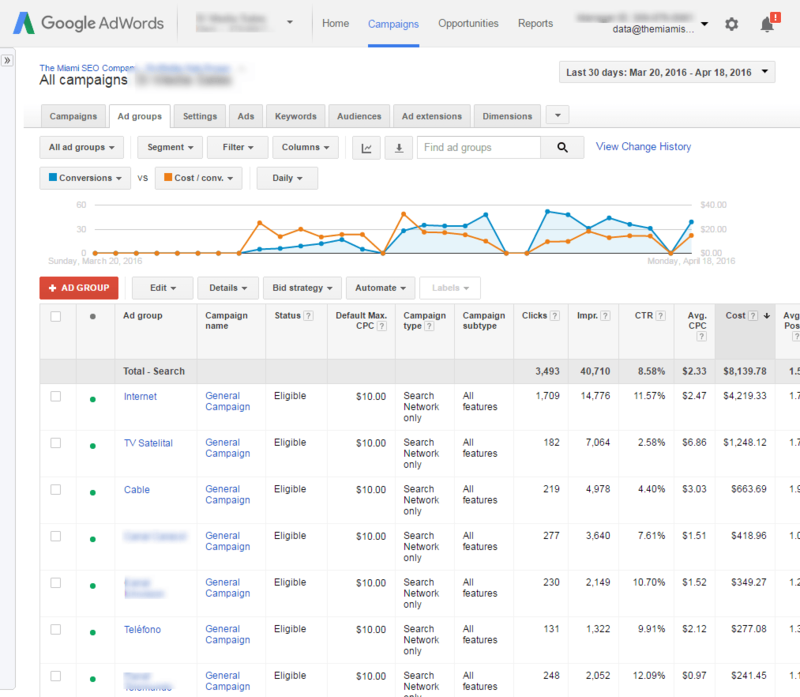 This company has a sales team that handles all of the inbound leads generated by this Adwords account, they never used Adwords before and are relying on us to keep the entire sales team busy. They couldn’t be happier with the leads they’re getting now because they were previously spending money on traditional advertising getting leads at around $100 per lead. Now they’re getting leads at around $10 – $15 per lead from our Google Adwords campaign that is converting at an average rate of 20%. In the screen shot to the left (click to expand), we’re looking at an account that spends about $15,000 per month in clicks. It’s a national ecommerce store that sells industrial cleaning equipment and we took over their Adwords account about a year ago now. They came to us seeking a service that would allow them to keep their monthly budget the same but that would also get them more and more sales each month without increasing the budget. We’ve been able to do that form them very successfully. Each month, we fine tuned the campaign so much that the cost per transaction reduced by 90%. The conversion rate increased by 80%. This means that they are paying 90% less for each transaction and the rate at which visitors convert into customers has increased tremendously. The client could not be happier and is more than happy to leave provide a reference for any prospects. 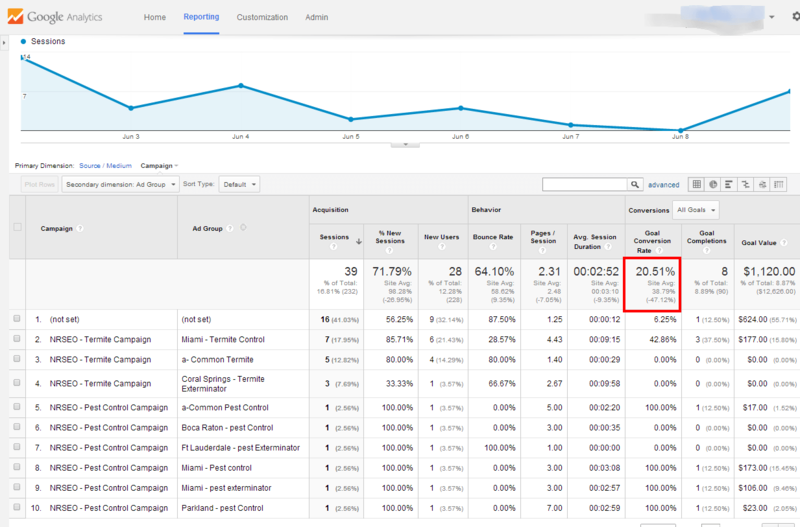 A linear graph like the one to the left (you can click on it to expand it) shows the performance of certain metrics over time in your Adwords account. In this case we assigned the blue line to display conversion rate averages for each week and in orange you’ll see the number of conversion obtained each week over time. The conversions in this case were phone calls and form submissions because its a service based business that offers installation and repairs on mobility products. As you can see since we’ve been managing the account, the number of conversions have gone up significantly while the cost has stayed the same (cost report below). You can feel free to visit the website www.statewidemobility(dot)com any time, you can even call the owner to ask for a testimonial ANY TIME. Recently we created a brand new PPC campaign for one of our clients who happens to be a local pest control company. We used a very laser targeted ad group structure that allowed for a very high quality score and a extremely low cost per conversion. We created ad groups for each city for a total of 180 ad groups in less than one business day with the help of our Excel savvy staff. 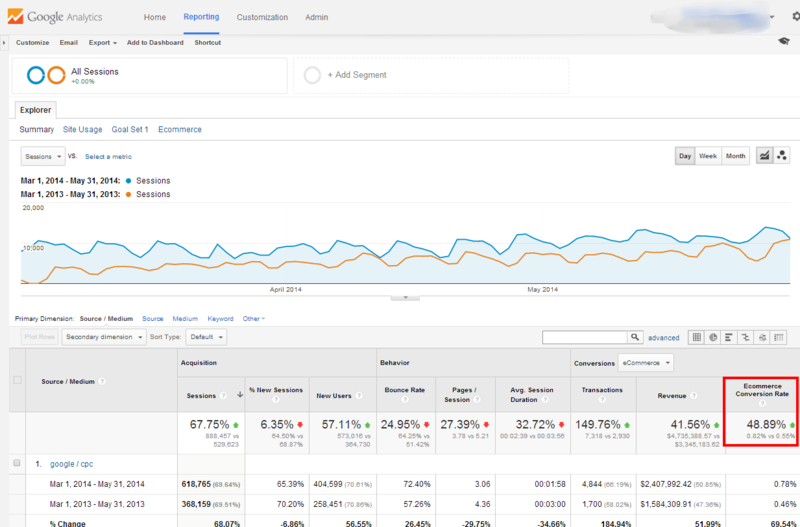 The conversion rate of the campaign is averaging over 39 percent since we launched. We are going to be updating this page after 90 days to show the campaigns performance with a bigger data sample but so far we are hitting a grand slam! 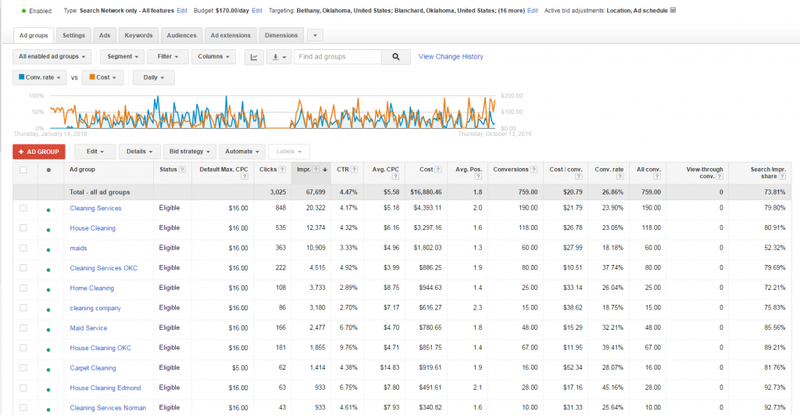 The conversions are tracking phone calls and form submissions that occur when Google visitors find the website solely. 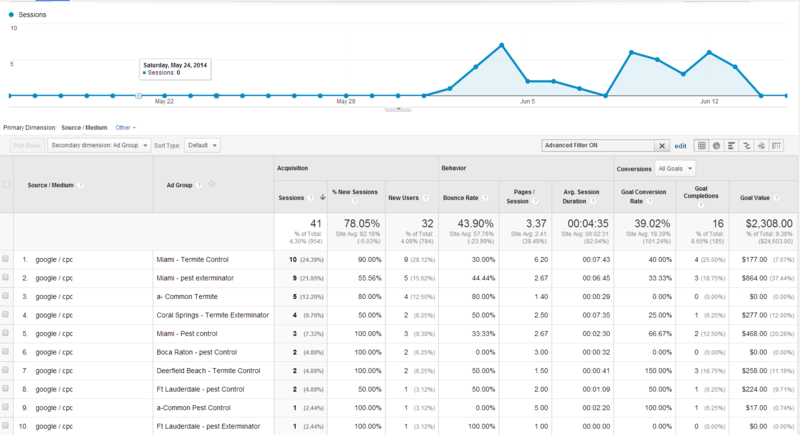 Before working with us, he had no idea how his campaign was performing and the only reports he got from his SEO company were keyword rank reports… The client now has his own reporting dashboard which is easy to access and available 24 hours a day with real time reporting! Looking for a company that you can put confidence in when handling your large budget PPC campaign? Let our team of experienced campaign managers analyze your current PPC strategy to point out what you’re doing wrong and what you’re doing right with a free website analysis. We can help you get the biggest bang for your buck when it comes to CPC advertising, don’t let a bad experience ruin your outlook on PPC advertising, IT DOES WORK! You just need a team that knows that they are doing to manage your pay per click campaign! We have the experience needed to efficiently increase your conversion rate and ROI regardless of the type of industry you’re in. We have plenty of case studies like this one that indicates we can improve campaign performance for large budget accounts like this one! We took this client on that sells heating and cooling parts and within 3 months we were able to increase their PPC conversion rate by over 50% the client has since then doubled his budget because the ROI is there to justify it! We setup ROI tracking dashboards that allows the executives at the company to track ROI in real time! Regardless of the size of your budget, each client gets the attention they deserve at The Miami SEO Company. Here is a case study from a smaller budget campaign ($3,000 per month on pay-per-click) that we are managing after he cancelled with his last PPC management company. We created a brand new campaign from scratch for him because the last marketing company was holding the campaign hostage. We created a campaign for him that has a very granular ad group structure based on cities through out Florida. Just how we target city specific pages to show up for keywords like “SEO Fort Lauderdale” and “Boca Raton SEO Company”, we recommended taking the same approach to our client. The conversion rate so far from the PPC campaign has averaged at just over 20% meaning, for every 10 visitors, at least 2 turn into a interested potential customer which is a great rate of conversion. Typically, a five to ten percent conversion rate is considered great for serviced based sites and for eCommerce shopping sites, you’re lucky if you can break a 2% conversion rate most of the time.